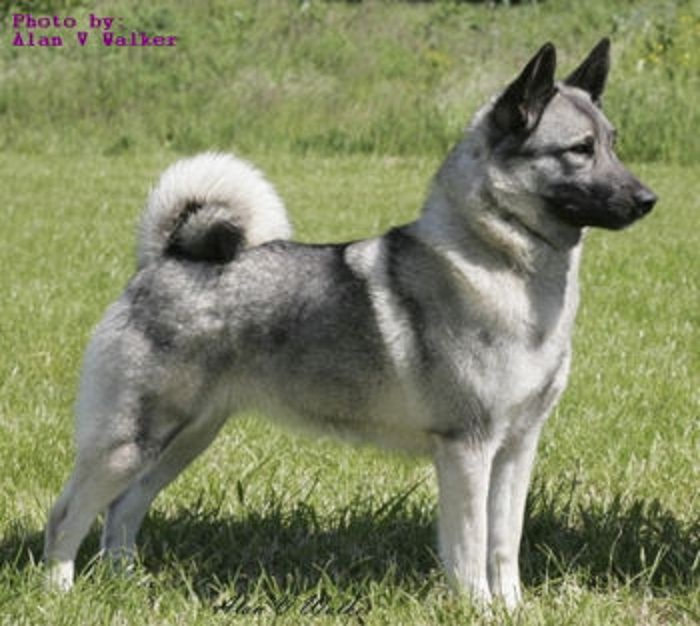 The Norwegian Elkhound originated in the breathtakingly beautiful and rugged country of Norway. He can be traced back roughly a thousand years, where a breed of dog similar in shape and size was used by the Vikings to guard and hunt. It's possible that the breed may reach back as far as 5000 BCE, since alongside other artifacts from a primitive culture, archaeologists have found skeletons of dogs greatly resembling the shape of the Norwegian Elkhound. Although its exact history is lost in time, there's little doubt that this breed is closely intertwined with the history of mankind. The Norwegian Elkhound has been a common fixture in the history of not only the Vikings but of Norwegian culture in general. The breed has been used to guard herds, flocks, and homes; and to hunt large game such as bear and moose. His role in hunting was to first track down his prey and then to hold it at bay by barking until the hunter could arrive to kill the animal. The Norwegian Elkhound became a breed of interest after the Norwegian Hunters Association held its first dog show in 1877. Shortly thereafter, breeders began an effort to create a breed standard and records, and to also shape the Norwegian Elkhound into a serious competitor in the conformation ring. Today, the Norwegian Elkhound makes a wonderful family companion and does well in a variety of dog sports and careers, including conformation, agility, obedience, flyball, freestyle, tracking, guarding, herding, sledding, and search and rescue. Norwegian Elkhounds are still used in their original capacity as hunting dogs as well.